* Pride of place to the Under-8 Footballers who won the Rhys Brady Memorial Shield on Saturday in Mayobridge writes Martin Maclean. 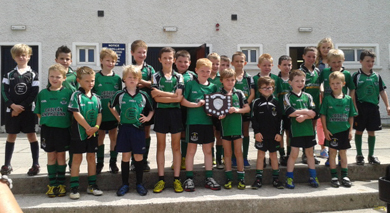 The Castlewellan GAc U-8 team who won the Rys Brady Memorial Shield at Mayobridge. The Boys performed brilliantly. It is great to see the smiles on their faces. It also made their parents very proud of them. Well done lads. Keep attending training and listening to the advice of your coaches. * Castlewellan U-16 footballers recorded a comprehensive 8-23 to 0-3 victory over Clann Na Derg in the championship on Thursday evening. The Town lads where much stronger all over the pitch and made their dominance count, playing some great football and racking up some great scores. Best of the forwards was the ever busy and dangerous Gareth McKibben while Ryan Lundy and Sean O’Boyle and Sean Conlon bossed midfield area. However, the towns best performers where at the back where Keelan Burns, Ronan Barr and Zach Carville gave the opposition nothing and limited them to just 3 scores. * A great week for the senior hurling team who got their first win of the year. they beat their arch rivals Carryduff 3-17 to 0-20 in what was a cracking game. Tussles between our two clubs in this fixture have provided great entertainment in the past. This game was no different. Great performances from Colm McCann, Aidan Keown, Jason Croskery and Tony Ferris. There was also a great return from Sean Hardy who scored 1-3. * The Under-14 hurling team got their championship up and running with a convincing win against Newry Shamrocks on Friday night winning 6-13 to 4-5. Good performances from Killian McCay, Eoin Maginn, Daniel Cunningham, Dara Mc Veigh, Matthew Muldoon, Sean Keown, Conor Mc Shane and James McAleenan. Training for the under 14 hurlers at 6.00pm on Thursday. * A primary 5-6 hurling blitz took place in St Malachy’s Park last Saturday. Portaferry brought two teams with them, Warrenpoint and Castlewellan with two teams. It was an enjoyable and entertaining afternoon of hurling where our young lads once again competed very strongly. Keep up practising lads. Training on Wednesday evening at 6.30pm. The next hurling blitz for this group is this Saturday in Portaferry at 1.00pm where the boys will compete in the McGrattan Cup. * The Senior Footballers suffered their first defeat of the season at the hands of Burren last Thursday night. It was a disappointing result with the Senior Championship coming up this weekend as all teams like to go into the first round on the back of a good result. This should act as a spur to right any wrongs in that defeat. First up for The Town will be Annaclone who defeated Clonduff last weekend. This will be a difficult fixture against a team who have established themselves in Division 1 this year. If their performance against us in the league is anything to go by then they clearly mean business. All roads will lead to Downpatrick next Saturday evening where the throw in is at 6.30pm. Come along and support the lads in this first championship outing. * The Seconds footballers recorded a good win against our neighbours Kilcoo on a very warm Sunday in St Malachy’s Park. It was a good game of football between two very committed teams who are still in the championship. The league may be out of our reach now but it will be important for the lads to keep putting in good performances. * Castlewellan GAC will once again be running their annual three monthly draw. The draws will take place on 31 August, 28 September and 26 October 2013. Please contact any member of the committee if you wish to purchase a ticket. This draw contributes to finance our ongoing developments necessary to facilitate the growing demand for Gaelic sport in the Town and Parish. We would urge as many members as possible to support this draw. * Please note coaching and training times for this week. On Tuesday 13 August Under 8 & Under 10 training at the Bann Road 6.30pm to 7.30pm. Saturday 10 August 10.00am-10.45am St Malachy’s Park Nursery, P1 & P2 Hurling and Camogie. 10.00am-10.45am St Malachy’s Park P3-P7 Camogie. 10.00am-11.00am St Malachy’s Park U12 Boys Hurling. 10.45am-11.30am St Malachy’s Park Nursery, P1 and P2 Boys Football and Girls Football. TBC St Malachy’s Park P5/P6 Hurling Blitz. Saturday 20 July Nursery, P1 and P2 plus Camogie up to Under 12. * The Attack Fitness Circuits will continue in The Club this Thursday evening at 7.00pm.. There will also be classes in St Malachy’s Park on Saturday mornings at 9.00am. * The weekly Castlewellan AC weekly runs continue every Tuesday and Thursday leaving the Club at 7.00pm. * The numbers in this week’s lotto were 3, 6, 10 and 25. There were no jackpot winners and one £20 winner Brian Dougherty. Next week’s jackpot is £4400.